I’ve enjoyed how much simpler my life in the kitchen has become ever since I got a stand mixer. I can multi-task whenever I need to mix something and not have to stand there. It’s such a simple tool, but so helpful. I’ve had this stand-mixer for over a year, but it still amazes me how I lived without it. My stand mixer came with the three usual attachments: paddle, whisk, and hook. I’ve used the first two numerous times, but I’ve never used the hook. I hear how tough it is to bake with yeast because you pretty much need to babysit the dough. However, D- encouraged me to finally make some bread with the hook. We decided to go with something that we can eat for dinner. 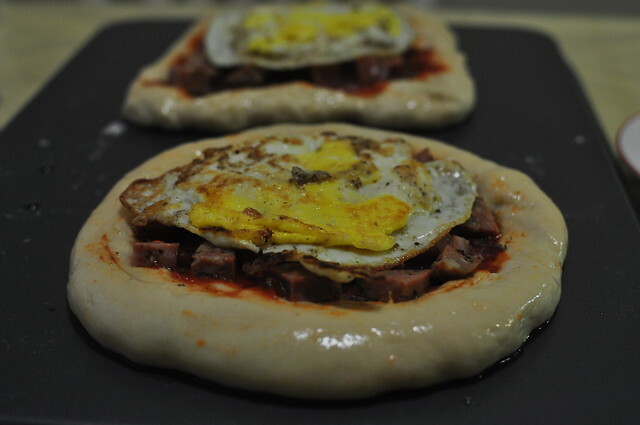 D- suggested to make a pizza dough, and I thought that was a great idea! 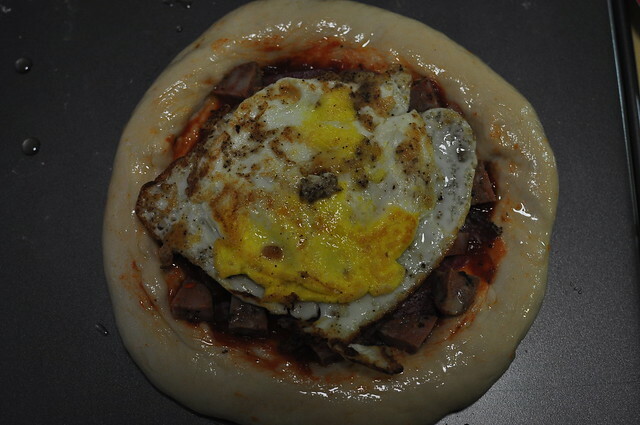 I turned to my trusty Alton Brown cookbook and got this pizza dough recipe. The most exciting thing about baking bread is to see the dough rise while the yeast is doing is thing. Sadly, I was too excited and did not get to get a picture of how much it rose, but it rose about half its size. 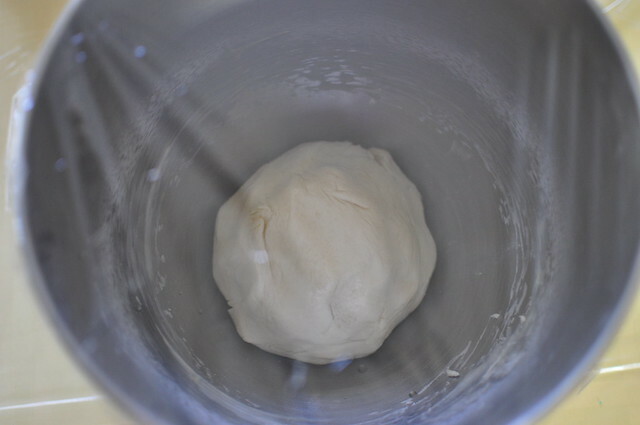 This is the dough before the rise. We kind of went crazy with the toppings. D- is a meat lover’s kind of guy… so it was a given that much meat was going into the pizza. 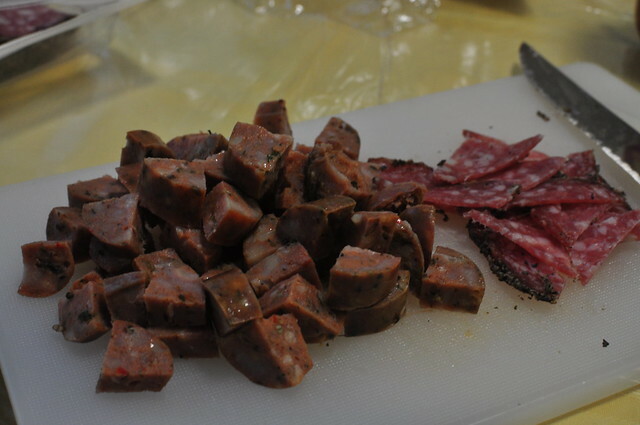 Luckily, this recipe made two personal pizzas so he could put as much meat as he wanted on his pizza. 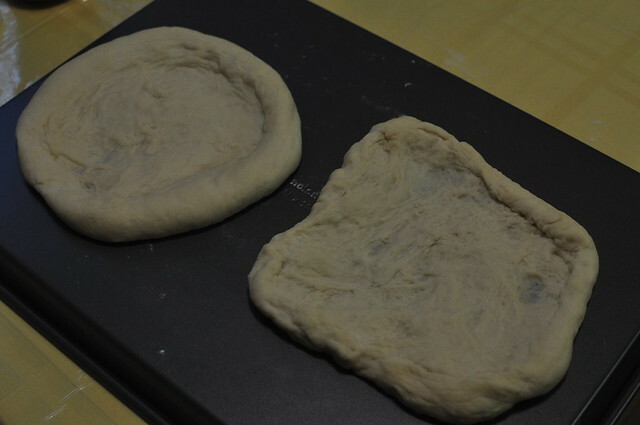 Here is our own pizza dough. 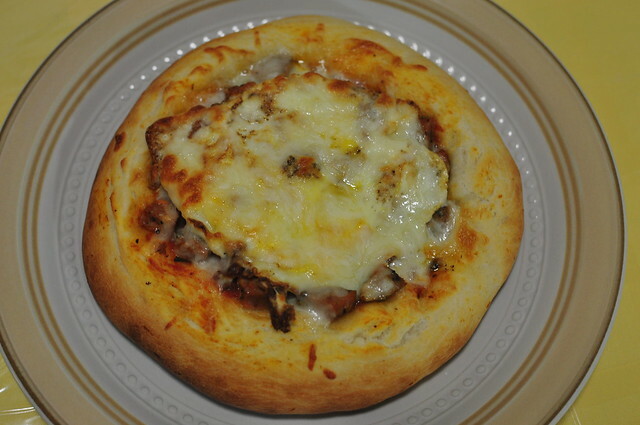 We both had a hard time creating the even round pizza with the crust on the side, but I miraculously managed to make it round. However, it was not even. I like to call D-‘s pizza rustic :). Alton suggests to only put a little bit of pizza sauce. 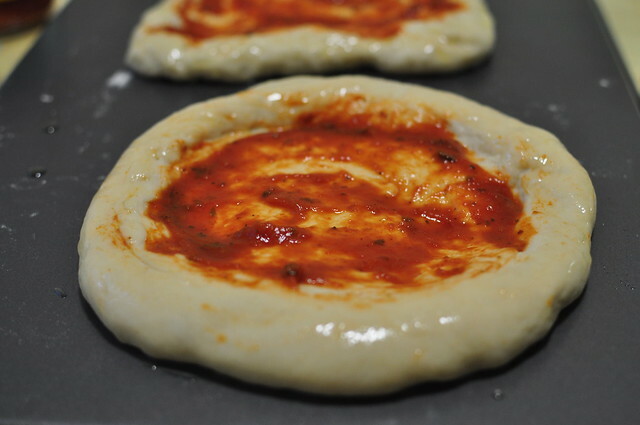 The star of the show is the pizza dough, not the sauce! I would have to agree with him. I love my pizza dough! On top of all the meat, we added another thing we both love… fried egg. Can’t forget the cheese! My favorite is mozzarella cheese. I can just munch on that stuff by itself! 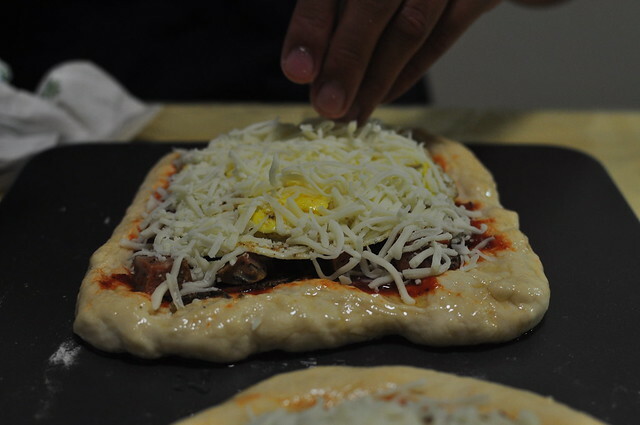 We put the cheese on last so that the toppings underneath don’t burn… and hold all of the toppings inside! 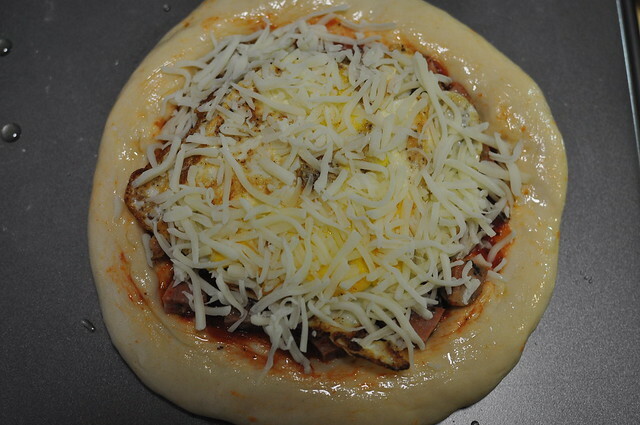 How was my experience making pizza for the first time? Great! 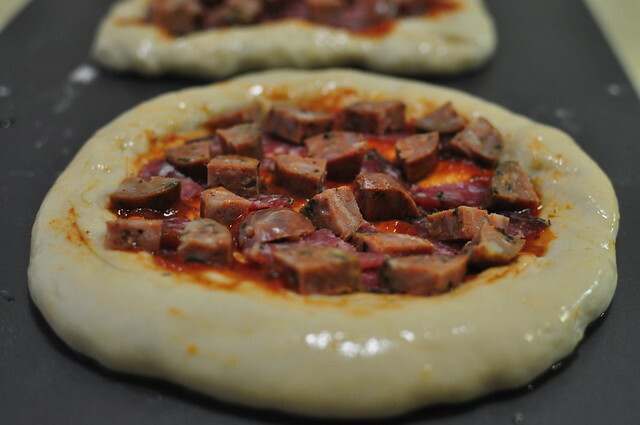 It is so fun baking with D- that we want to make pizzas again in the near future. 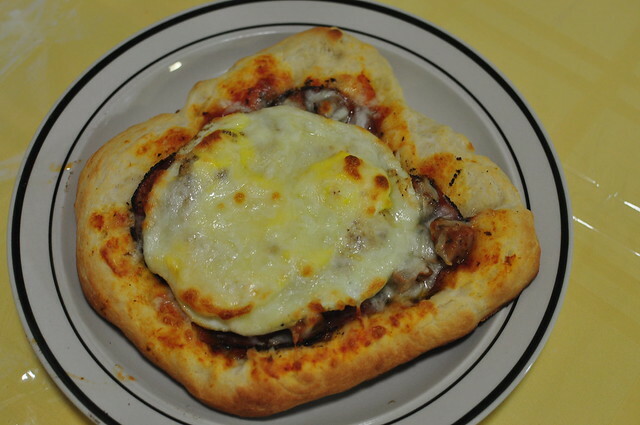 The pizza tasted amazing, even though some might say the presentation could use a little work. Who cares though, right? It’s the taste that counts. Besides, I kind of like the rustic look. Brush the rim of the pizza with olive oil. Insert Your Favorite pizza sauce and toppings here! This entry was posted in Bread, Recipes and tagged alton brown, bread, dough, mini, pizza, recipes on September 5, 2012 by Krystal.